Seventeen-year-old Ike Watson had just woken from a nap Tuesday afternoon when his bedroom window shattered. The impact was strong enough to send glass across the room, and shards became embedded in the opposite wall, his mother said. Before the Valdez teenager had a chance to react, something smacked into the wall next to him, narrowly missing his head. When he looked down, a large raptor was flopping weakly on his bedroom floor. “It startled me, definitely,” he said — enough to make the still-groggy teenager jump off the bed and run into the hall, where his mom, Jennifer Watson, was coming to investigate the noise. Her first thought was that snow sloughing off the roof must have broken through her son’s window, she said. 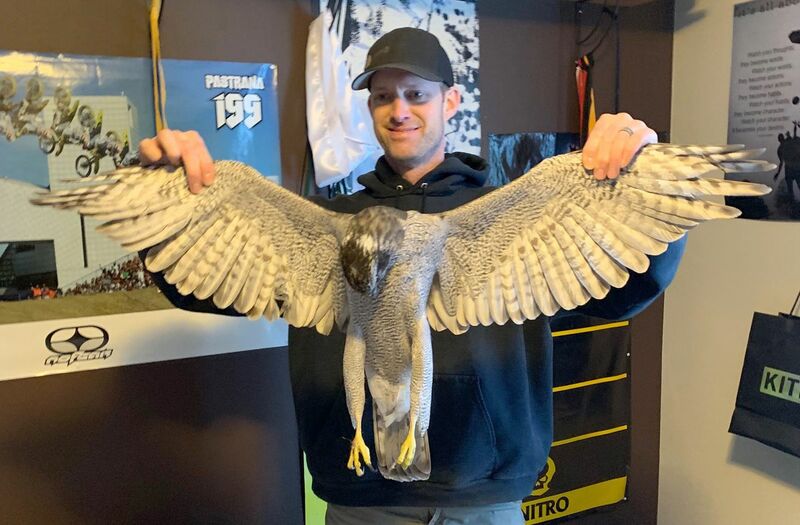 Biologists with the Bird Treatment and Learning Center and the Alaska Raptor Center identified the bird as an adult northern goshawk, an apex predator found in most of Alaska. Jennifer Watson said that while robins, crows and ravens frequent the wooded area near the family’s subdivision, she’d never seen a goshawk before. Guy Runco, the executive director of the Anchorage-based Bird Treatment and Learning Center, said the raptors tend to be elusive and secretive, so even though they’re fairly prevalent in Alaska, they’re rarely seen. Jennifer and Ike Watson were hesitant to go back in the room, fearing the bird might awaken and become aggressive. When they returned with Ike’s father in tow, the goshawk was dead. Chris Watson made sure of it by poking it with a ruler, his son said. The double-pane window the bird had crashed through was destroyed, and down below it, Ike noticed something else: another, smaller bird, dead in the snow. Biologists identified the smaller bird as an adult male spruce grouse. What the Watsons most likely had on their hands, said Ken Marsh, a spokesman for the Alaska Department of Fish and Game, was what he called a “predator-prey story.” The spruce grouse was probably fleeing from the goshawk when Ike Watson’s bedroom window brought the chase to an abrupt end. "It looks very much like the goshawk was in pursuit of its natural prey,” he said. What likely happened is that the spruce grouse hit the window while desperately attempting to flee its predator, only to have the singularly focused goshawk follow it at a speed great enough to break the glass, Marsh said. Runco of the Bird Treatment and Learning Center agreed with that conclusion, “100 percent,” he said. Goshawks can fly at speeds of more than 30 mph, according to various reference guides. The birds are — usually — known for their maneuverability, Runco said. 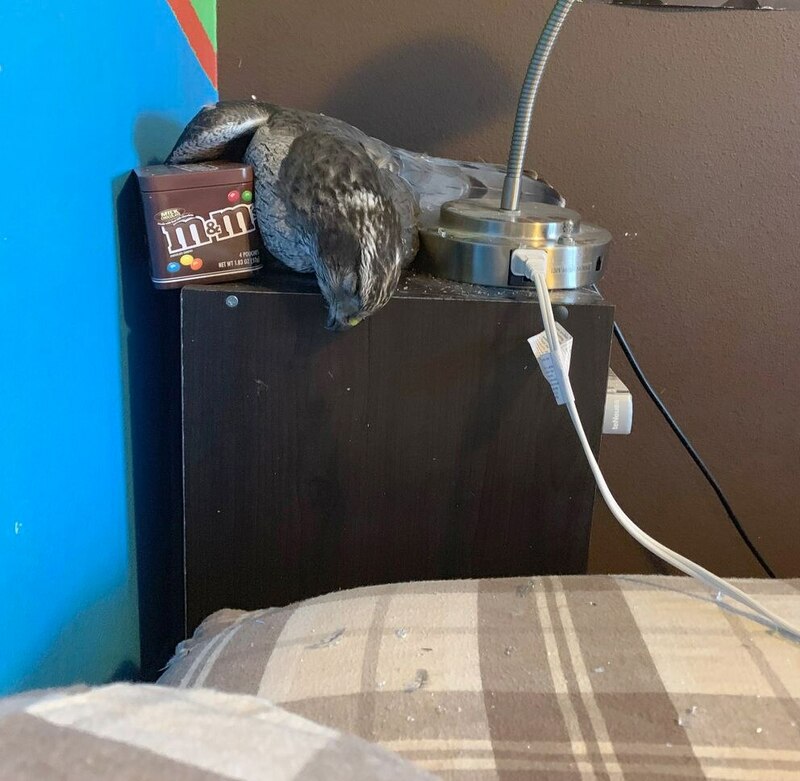 In this case, the bird may have seen the house and attempted to maneuver out of the way, only to hit what it didn’t realize was a window, he said. Ornithologists at Cornell University have called the raptors “reckless hunters” for their tendency to continue pursuing their prey at high speeds for long periods of time, even if it means going into water or crashing through brush. The birds are now wrapped up in the Watsons' freezer until the family can decide what to do with them, Jennifer Watson said. They’re considering having the remains taxidermied and mounted. She said she’s teased her son about making the birds into a mobile to hang above his bed. Ike wasn’t keen on the idea. “I don’t know if I want that in my room,” he said.